KRAFT Asian Sesame Dressing and KRAFT Peanut Butter team up to make the perfect sauce for this flavourful stir-fry. Add 2 tsp. oil to nonstick wok or large nonstick skillet; heat on medium-high heat. Add meat, stir-fry 3 to 4 min. or until done. Transfer to bowl; cover to keep warm. Heat remaining oil in wok. Add onions, red peppers, garlic and ginger; stir-fry 5 min. or until crisp-tender. Add dressing mixture; stir-fry 1 min. or until heated through. Stir in spinach and meat; cook 1 to 2 min. or just until spinach is wilted, stirring occasionally. Substitute an orange or yellow pepper for the red pepper. 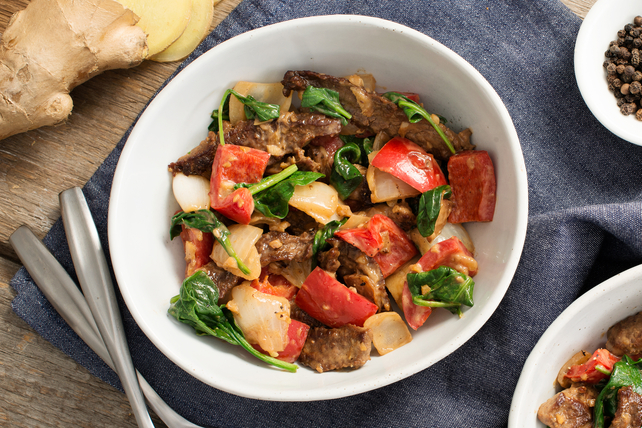 Add 2 green onions, cut into 1-inch lengths, to the stir-fry along with the spinach and cooked meat.